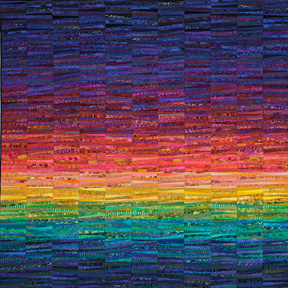 Art quilting, fiber art or whatever you choose to call it, has had its share of controversy. That statement might surprise many people. Let me give some background. For many traditional quilters, art quilts and the techniques involved didn’t seem to fit in with traditional quilting. Which was true, there were some elements of traditional quilting involved, but more & more, as this form developed, the techniques became less like traditional quilting and more like art. On the other hand, the art world tended to view art quilting as more arts & crafts than art work, & certainly not a genuine art form. Museums didn’t accept fiber or quilt arts. Art shows and exhibits generally didn’t accept entries. Many art quilters and fiber artists felt they didn’t fit in anywhere. I think Jane Dunneworld sums up the struggle that any new art movement has with the establishment. “Art Quilts: Emerging Genres This is the text of a lecture given on February 1, 2011, in conjunction with the Form/Not Function art quilt exhibition at the Carnegie Center for Art in New Albany, Indiana. After discussing the struggle various art movements went through to gain acceptance from the status quo she made these comparisons.
. “Because in every case, artists introducing a new way of defining and quantifying art met resistance from the galleries and artists who were the established powerhouses of the day. Most of the movements I’ve mentioned were actually labeled as degenerate by the Nazis…. The field is now 40 years old, and genres are emerging. Some are recognizably linked back to traditional quilts. Others are not. 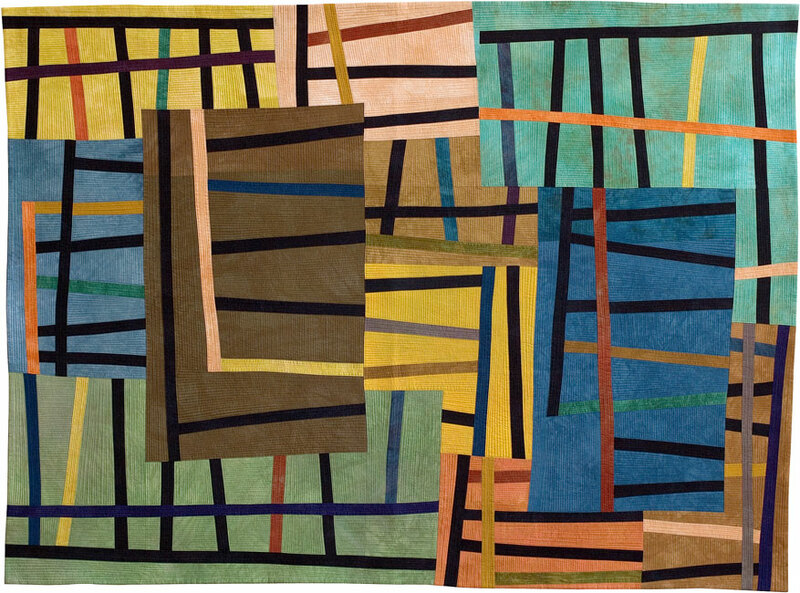 What is true is that the same struggle to find a unique voice that characterizes ALL of modern art history is going on now – as art quilts evolve as an art form “. In the 60’s a change in the perception of quilts as art came in the persons of two art collectors, Jonathan Holstein and Gale van der Hoof. They began collecting quilts for their artistic value instead of their utilitarian value. Due to their influence the Whitney Museum in New York opened an exhibition composed of quilts.. Change was in the air. Organizations like Quilt National, Quilt San Diego and SAQA began to be formed to raise awareness and promote this art form. A quote from SAQA’S web site concerning their founding & mission gives insight into the determination of art quilters to be heard. Due to the efforts of many pioneers of the movement, things are changing. 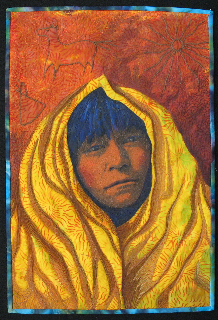 Quilt artist Ann Fahl, suggests that the support and solidarity of art quilters has contributed to raised awareness. “What I see… is considerable support, sharing and networking between quilters. …We have formed large groups like SAQA, smaller regional organizations like PAQA in Chicago area, and personal and critique groups that meet in living rooms and studios across the country. ..We are also fortunate to have organized large exhibitions and competitions world-wide, that offer lectures, workshops, vendors and exhibits open to everyone. Hard earned acceptance in the art community has been coming, many museums are including fiber art these day . Emerging and respected fiber artists are gaining recognition. 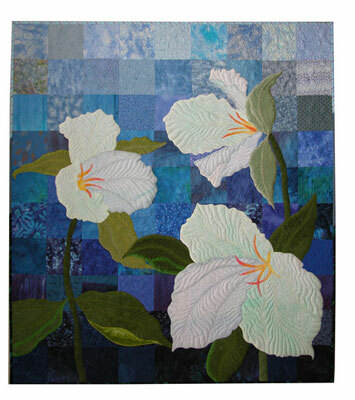 One thing is for certain, art quilting is here to stay. It is rising in popularity, and this art form is evolving in many new innovative directions as well. Exciting things are happening. What this means for art collectors and the general public alike is this; now is a good time to buy art quilts & fiber art. You can afford original art for very reasonable prices. Especially attractive is the fact that their value continues to rise. 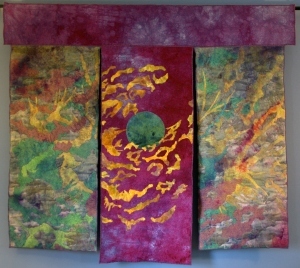 From an investment standpoint, fiber art is currently a bargain. This won’t be the case for long. There is a window of opportunity that will close soon. Because the art quilt has arrived, & the only place it is going is up!